Toronto Police members raised $340,000 this year for United Way Greater Toronto. The announcement was made on December 11 at police headquarters. Goodwin Gibson, the senior vice-president of donor relations & marketing with United Way of Greater Toronto, thanked Service members for the generous contribution. FOCUS Situation tables bring together police with community agencies at weekly roundtables to provide a targeted, wrap-around approach to the most vulnerable individuals, families and places that are experiencing heightened levels of risk. 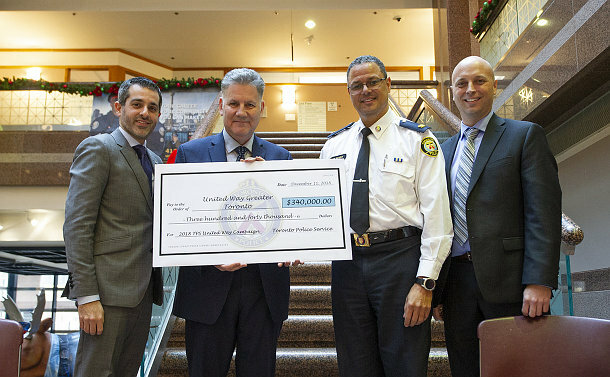 This year, the Toronto Police Services Board (TPSB) donated $10,000 from its special fund to the campaign. Superintendent Reuben Stroble, the 2017 Toronto Police United Way campaign chair, thanked the volunteers and donors. They include G & G Electronics which since 2003 has raised and donated back over $23,000 to the United Way of Greater Toronto. As part of this year’s campaign, about 5,000 pairs of socks were collected for Haven Toronto which is a drop-in centre in the city for men over 50 living in poverty. Executive director Lauro Monteiro accepted the donation on behalf of Haven Toronto. McGregor Industries donated 2,000 pairs of socks while Bloor Fitness & Boxing, which is in 11 Division, contributed about 500 pairs.